Sometimes we can be held back from the spiritual renewal offered through Lent by a primal emotion that keeps faith from flourishing: fear. Fear is a crucial response in human life to protect us from physical, emotional and even spiritual threats, but misplaced spiritual fear can keep us from living out the Gospel call to faith. Debilitating spiritual fear can emerge from two seemingly disparate sources. On the one hand, fear can emerge from the anxiety that the hard work, the penance, the suffering, the choosing of God’s way over our own way is simply not worth it. Concerns might surface that faith is a smokescreen for meaninglessness, for suckers who cannot accept the hard reality of nothingness at the core of human existence. On the other hand, there can exist a fear that does not question the reality of God, but questions whether we are worthy to stand before God, whether we are acceptable to God as we are and whether, finally, we deserve God’s love. The Second Letter to Timothy presents Paul speaking to “my beloved child,” Timothy, asking him to “rekindle the gift of God” that was given to him. Timothy is reminded that “God did not give us a spirit of cowardice, but rather a spirit of power and of love and of self-discipline. Do not be ashamed, then, of the testimony about our Lord or of me his prisoner, but join with me in suffering for the gospel, relying on the power of God” (1:7-8). Paul’s challenge to Timothy gets to the heart of the first form of fear that can strike even the boldest of believers. Is it truly worth it to suffer? To be imprisoned, persecuted, or mocked for my faith and belief? Is it worth turning from the pleasures of wealth and success to serve those in need or challenge the engines of power? What if I am wrong about all this? Whether Timothy had in fact lost the flame of his faith or adopted a “spirit of cowardice” or was “ashamed,” the context suggests that in light of human setbacks, loss and suffering, even established faith can be shaken by fear. The letter does not deny the possibility that such fears are at work in us but directs us to the experiences of power, love and self-discipline that emerge from faith in God. Fear is not countered with theological arguments, but by asking Timothy to “join with me in suffering for the Gospel.” It is in following the path of Jesus that faith dissipates fear through the experience of the reality of God’s grace. Whether we fear that faith is meaningless or that we are meaningless, it is ultimately our experience of God that reveals God’s love for us and burns away the fog of fear. 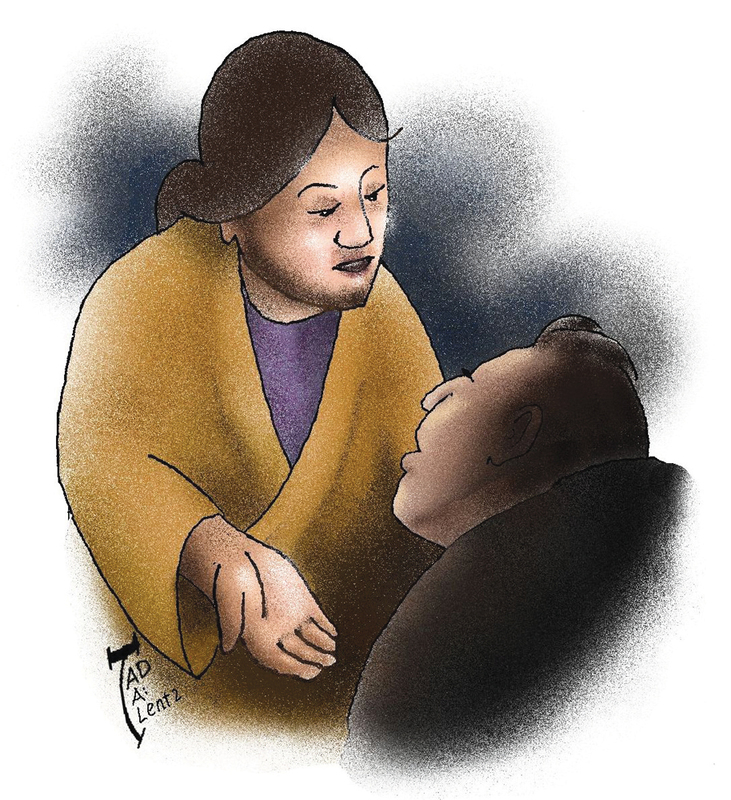 These experiences might come in the most humble of circumstances, by serving someone in need or listening to a friend in distress or in the most profound encounter with the living God. But if our fears tell us either that our faith has no substance or that we are not worthy of God’s love, it is time for us to reach out and grasp the hand of Jesus. Have no fear, for his hand outstretched to us allows us to stand in the presence of God, for God has come to save us, knowing fully our weakness and sin. Want the upcoming Sunday's Word column, along with posts from the archives, emailed to you each Wednesday? Sign up for our Word newsletter here. “Away With Fear” very useful as a road map to finding God, a known and well-travelled road by many. I’ve also learned and am still learning that to find God it doesn’t always have to be in accord with the somewhat stern but hope-filled command, AWAY with fear! It can also be the gentler, loving utilization of one’s personal psychological factors become tangible in what I call, a way with fear, with fear becoming the "way." Yes, gestating fear actually provides a way to God. I dare say many people suffer from fear-producing-anxiety, rooted in some degree of an anxiety neurosis, of which I have some familiarity. This can be a grace. Within that frame I’ve discovered that using my anxieties, my fears, in union with Jesus’ whole life fears, from infant to toddler, to child, to young man, to his three years "on the road", to his Passion, his fear in the Garden, continuing during his arrest, interrogation , journey to execution at Calvary, along with the emotion-draining anxiety driven fear on the Cross, that caused Jesus to cry out, to God frightened and fearful that the Father had abandoned him, that fear among the greatest of human fears to endure – parental abandonment! Far from keeping Faith from flourishing, this actually deepens Faith. But this deepening doesn’t happen supported by heavenly consolation, sweetness and bells and harps and such. On the contrary, in shadows there is simply the satisfaction flowing through it all that, one walks with Jesus. In a way this road is terribly bumpy, but somehow it works in getting one to go from Gospel to life and from life back to the Gospel with at least a little success. That’s good enough for me always hoping to do better and ever mindful of the words of one of my favorite saints, the holy Capuchin Franciscan Brother, St. Conrad of Parzham, “The Cross is my book. One look at the Cross and I know what I have to do.” "Away With Fear" a very good Lenten road to Jesus. This article also appeared in print, under the headline "Away With Fear," in the March 10, 2014 issue. John W. Martens is an associate professor of theology at the University of St. Thomas, St. Paul, Minn.